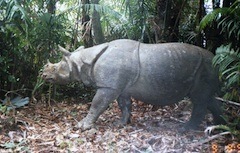 The Sumatran rhino population is threatened by both poachers and habitat destruction. JAKARTA, INDONESIA, March 5 2014. The Indonesian Council of Ulama (MUI) has issued a fatwa, or edict, requiring the country’s 200 million Muslims to take an active role in protecting threatened species including tigers, rhinos, elephants and orangutans. The fatwa, which has been widely acclaimed in the world’s media this week, is one of the first of its kind in the world and it will be accompanied by an education programme to help communities put it into practice. The edict reinforces the Indonesian government’s policies on preserving and protecting threatened animals and it is aimed at providing legal certainty on the question of Islam’s perspective on animals classified as “vulnerable”, “endangered” or threatened with extinction. “This fatwa is issued to give an explanation, as well as guidance, to all Muslims in Indonesia on the sharia law perspective on issues related to animal conservation,” said Dr Hayu Prabowo, head of the MUI’s Agency for Honouring Environment and Natural Resources, an agency established in 2010 with the aim of contributing to Indonesia’s environmental well being. 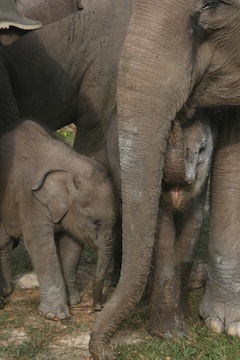 The illegal ivory trade and plantation owners protecting their trees put Sumatran elephants in jeopardy. “Animals are viewed in Islam as being key parts of an ecosystem that in the end, also benefits the livelihood of human beings,” Dr Hayu added. The World Wildlife Fund praised the council’s decision. "It provides a spiritual aspect and raises moral awareness, which will help us in our work to protect and save the remaining wildlife in the country, such as the critically endangered tigers and rhinos,” said WWF-Indonesia's communications director, Nyoman Iswara Yoga. The fatwa partly came about after a fieldtrip co-organised by Universitas Nasional (UNAS), WWF-Indonesia and ARC (with financial help from WWF-UK) in September 2013. They arranged for Muslim leaders to visit field sites in Sumatra where there was encroachment by wildlife, particularly by elephants. The Muslim leaders replied: “They are creations of Allah, as we are. It is haram [forbidden] to kill them and keeping them alive is part of the worship of God.” When the Muslim leaders returned to Jakarta they realised that many people around the country were looking for an indication on how to act with wildlife, so they began the process of creating a fatwa, or edict. The intention was to guide people to protect threatened species because it is the right thing to do and because it is the Islamic thing to do. The fatwa was developed by MUI in consultation with environmental activists and academics affiliated with the National University in Jakarta. This core group was quickly joined by the Director for Biodiversity Conservation at the Ministry of Forestry, WWF Indonesia, Fauna and Flora International, and the Indonesian Tiger Conservation Forum (Harimau Kita). The UK-based Alliance of Religions and Conservation (ARC), has been a key partner of the National University. “It is a critical time for the MUI to issue such a fatwa to support attempts to protect rare animals. Indonesia has suffered a huge loss of its wildlife, due to hunting, logging, plantations and encroachment. In the wild we now have fewer than 500 tigers, 400 rhino, several thousand elephants and just a few thousand orangutan in the whole country,” said Dr Fachruddin Mangunjaya, Religion and Environment Program Manager at National University’s Institute for Research and Community Service and ARC’s chief advisor on this programme. “For the next step, we need to help MUI disseminate the fatwa to remote areas where tigers, rhinos, orangutan, turtles, elephants and other threatened species live, working through sermons or preachers (what we call Conservation Preachers--Dai Konservasi),” he said. 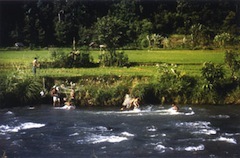 The Batang Gadis National Park was created after campaigning action by Muslim school students. WWF Indonesia welcomed the MUI’s extraordinary move. “It is expected that a religious approach to conservation efforts, especially through a fatwa, will help members of the public, especially Muslim communities, become aware of the importance of conserving endangered animals,” said Anwar Purwoto, WWF-Indonesia's Program Director for Sumatera and Kalimantan..
“We hope the issuing of this new fatwa in the most populous Muslim country in the world will inspire Muslims everywhere to protect threatened wildlife and their habitats,” said ARC’s secretary general, Martin Palmer. International donor agencies, including WWF-UK, the U.S. Fish & Wildlife Service’s Rhinoceros and Tiger Conservation Fund, the Mohamed bin Zayed Species Conservation Fund, and the Mott Foundation, were instrumental in this initiative. There are only 400-500 Sumatran Tigers left in the wild. According to TRAFFIC (WWF and IUCN programme for monitoring of the illegal wildlife trade) during the course of 1998-2002 every year there were at least 50 Sumatran Tigers killed from poaching. The population also faces risks from habitat destruction caused by commercial agriculture and illegal logging. Each Sumatran Elephant needs around 20sqkm of 'home range' space in a day to provide the 150kg of food and 80-200 litres of water it needs. The growth in palm oil cultivation as well as mining and house building in Sumatera Island all contribute to one of the worst deforestation rates in the world, thus creating increasing tension between the elephant and human populations. As well as being killed by poachers, elephants are being poisoned or dying in traps set by plantation owners trying to prevent them damaging or eating the young palm oil trees in plantation areas. As a response to this around Tesso National Park WWF has set up the first elephant-mounted Flying Squad Elephant Patrol Team whose task is to redirect wild elephants away from the plantations and back into the forest. This has been so successful that now the palm oil companies are supporting the scheme financially. 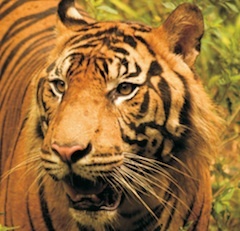 Download WWF factsheets about tigers and elephants in Indonesia. HRH Prince Charles on February 13, earlier this month, spoke out at a key intergovernmental wildlife meeting in London to mention the initiatives by faiths to protect wildlife. The first World Wildlife Day (determined by the UN General Assembly last December) is on March 3 this year: this new fatwa might be a good subject of a feature at that time. MUI (Majelis Ulama Indonesia) is Indonesia’s top clerical body. This is the first fatwa to protect wildlife in Indonesia. However it is not the first environmental fatwa. In 1992, in response to the growing use of imported rhino horn for making ceremonial jambiya daggers, the Grand Mufti of Yemen issued a fatwa against killing animals unless for meat or self-protection. In 2006/2007 the MUI issued a fatwa on illegal logging and illegal mining, via its regional council in Kalimantan region, Sumatra. This was followed in 2011 by a national fatwa on “Environmentally Friendly Mining”. WWF factsheets giving more detail on tigers and elephants in Indonesia and what people can do to protect them. Contemporary commercial TCM has lost touch with its Daoist roots and continues to provide a demand for body parts taken from illegally killed endangered animals. By pointing out that effective medicine must always contribute to restoring harmony in nature Daoist leaders are challenging this practice as both morally and medically wrong.